Loving your nation is not a crime, but that love should never blind us to its transgressions. We must hold them accountable for their misdeeds. In today’s politically charged climate, both in the US and in South Asia, it is safe to say that politics have become incredibly divisive and polarizing. They have left us more and more exasperated with our bureaucracies and policies. Born from such conflicts are both nationalists and patriots, two terms which sound quite similar but I feel have taken on two distinct definitions. 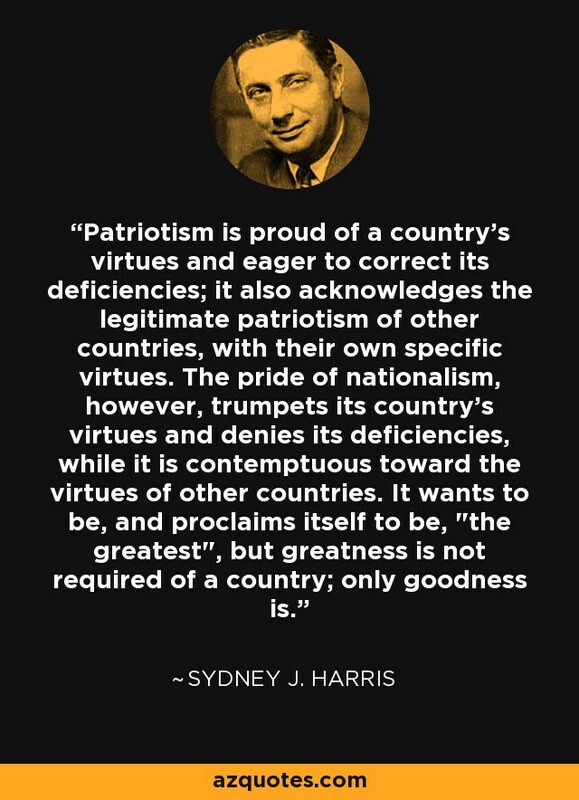 And it is important to distinguish the fine line between nationalism and patriotism, in order for us to improve as a society. For the purposes of this article, I will discuss nationalism and patriotism within the United States, India, and Pakistan. 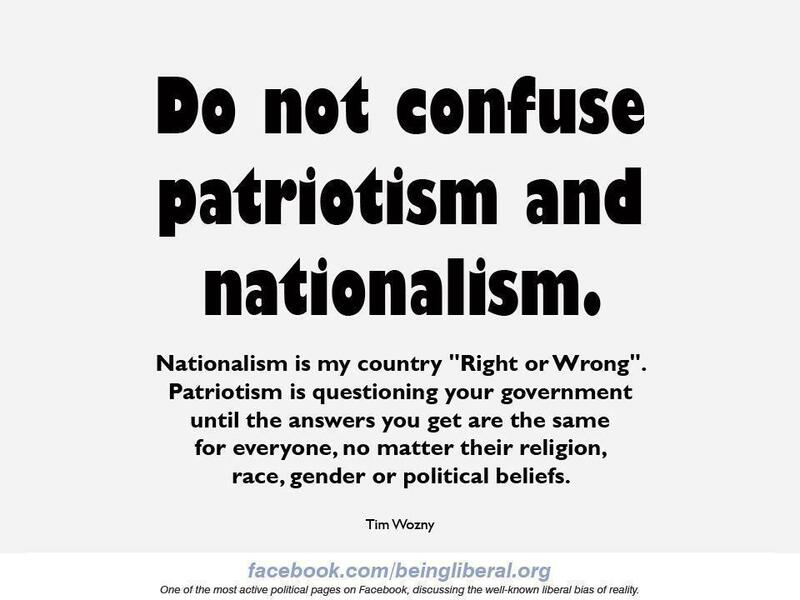 Allow me to distinguish the difference between patriotism and nationalism, as I have always interpreted the two concepts: Nationalism is where no matter what your country or government does, you will always support it and justify it, no matter how wrong or harmful it is. In essence, it is a type of brainwashing used to amass blind and unwavering loyalty. Patriotism, on the other hand, is having a deep love for your country and/or government, but not so much that one gets lost in their devotion. It involves constructive criticism of one’s nation and its policies that they believe to be wrong and unjust, not to be pessimistic, but because they want better for their country and for their people. A patriot denounces the actions of their government that they know are unacceptable. A nationalist believes that their nation is superior to all others and therefore their actions can always be justified. A patriot is proud of their nation, yet admits its faults and does not belittle other nations and regard them as inferior. The danger arises when a patriot becomes a nationalist, when they find a rationalization for everything that the state does, despite any repercussions that may arise. 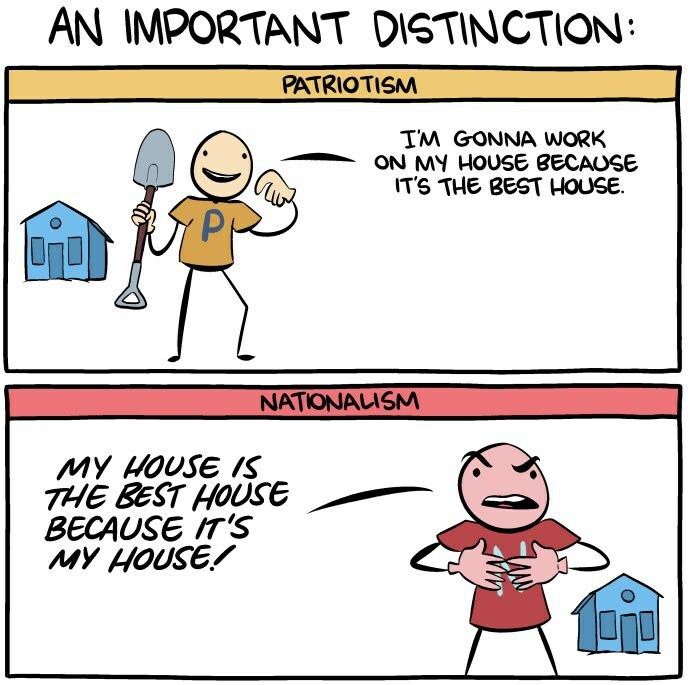 Has nationalism always been a part of our society? Without a doubt. It is nothing new, and it has been used for propaganda to garner support for countless causes and policies enacted by our different administrations. It has been used to justify acts of terror, human rights violations, and countless other atrocities. Throughout Donald Trump’s campaign and since his election, the rise of nationalism among his supporters has been alarming. From defending his words in the leaked recording of the Access Hollywood tape saying that it was “locker room talk”, to justifying him calling Mexicans rapists, to his more recent acts as president such as the countless drone strikes in Iraq, Yemen, and Syria (one of which involved the death of over 200 civilians), and his collusion with Russia, it seems there is nothing Donald Trump can do that will earn him condemnation from his devoted base. Nationalists refuse to regard the actions of the United States critically when it comes to their foreign policy and their misdeeds. A nationalist will not condemn white supremacy (in fact, many of them promote it), and will remain willfully ignorant of the transgressions of the US and their government, whether it involves the systematic institutionalized racism within low socioeconomic communities, or the actions of the government in the Middle East. I have encountered countless people whom I would deem nationalists who have reluctantly admitted that yes, some of the actions and policies of the United States government are “problematic” and “imperfect” but that on the whole they are still better than other nations. They don’t see the need for improvement. Are laws and policies in the US better than other countries? Perhaps in some ways, but that doesn't mean that we accept the imperfections and infractions of the country. As human beings we must be constantly working on improving things that need to be improved, and criticizing where criticism is warranted. When it comes to peace between Pakistan and India, nationalists have a staggering amount of tunnel vision. Indian nationalists claim that they are always the ones to initiate and maintain peace talks, and that it is Pakistan that keeps halting the process with their acts of terror and their overall refusal to cooperate with India with regards to Kashmir and other conflicts. They refuse to acknowledge their own hand in preventing peace when, for example, the army blinds protesters in Kashmir, or when political parties such as MNS and BJP ban Pakistani artists in India. Indian nationalists justify the army’s actions saying that they are all in self-defense from Pakistan. In essence, they are blind to their own contributions to the conflict. Meanwhile, Pakistani nationalists are no less oblivious; they claim that the actions against India are either in self-defense or to “liberate” Kashmir. They assert that the treatment of Muslims in India, such as the lynchings of Muslims who are accused of eating beef in regions of the country where Hindu nationalism is rising, is why they give thanks that they have their own Muslim country where they are free to practice their religion without persecution. But again, they fail to recognize their own privilege: Sure, as a Sunni Muslim majority nation, many of the citizens are free from persecution. But what about the mistreatment of Shias, Christians, Ahmadis, Hindus, and other minorities within the nation? It is true, some minorities face more obstacles than others, and there are certainly people within these minority groups who would contend that they have faced minimal discrimination. However, for a large group of such people, they cannot enjoy the same privileges that many Sunni Muslims in Pakistan do enjoy. The Constitution of Pakistan does discriminate against minorities, and it is estimated that around 5,000 Hindus migrate from Pakistan to India every year. Also keep in mind, that there are many Pakistani and Indian nationalists who criticize constantly put down their governments when comparing them to the western nations, which in their eyes are an ideal utopia. But they become nationalists very quickly when the comparison is between India and Pakistan, each boasting the perceived superiority of their own nation. In my opinion, there is no question that religious minorities are treated much better and have more rights in India than in Pakistan. It is far easier for a Muslim in India to rise up in ranks than a religious minority in Pakistan. However, this does not mean that their circumstances are perfect, and that changes in society and the system are not necessary for the well-being and equality of minorities. Just because minorities have more rights and are in a better position in India than those in Pakistan, it doesn’t negate the need for criticizing those policies that are discriminatory and changing the narrative of Hindu nationalist parties. It also does not mean that Pakistan has not made progress on this front, like when the government of Pakistan recently restored a historic Hindu mandir in Punjab, and that such accomplishments should be ignored. The bottom line here is that infractions have been committed by the administrations on both sides of the border; neither one is blameless in keeping the conflict alive. And both nations have flaws which need to be improved, and have made progresses which must be acknowledged and celebrated. As human beings we must abide by our morals and advocate for the rights of everyone. Loyalty should never be blind. A patriot’s love is constructive, whereas a nationalist believes in the superiority of their nation above all others, hence why it can do no wrong. I'm extremely loyal to the nations that I identify with; I love my culture and am proud to call myself a member of such nations. But that doesn't mean I will remain indifferent to what they do wrong. 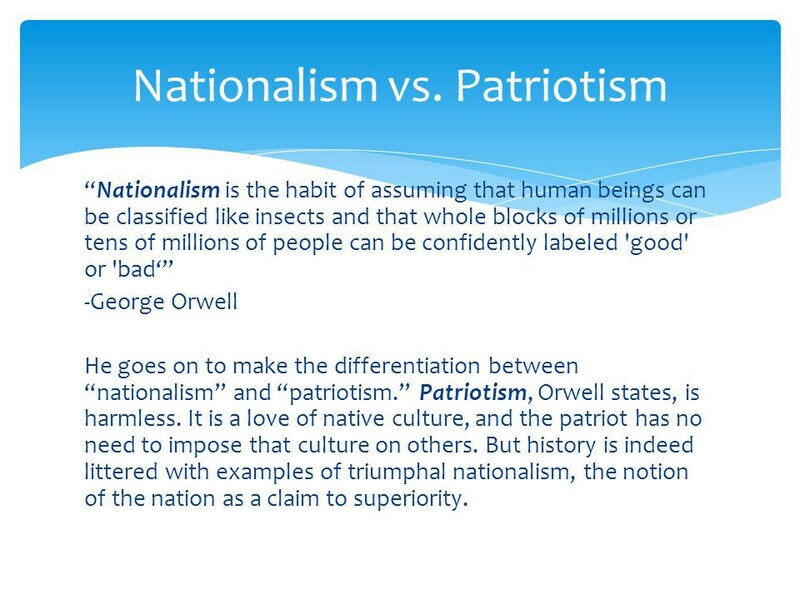 A few weeks ago, I was having a conversation about this topic with a family member and they eloquently distinguished the difference between nationalism and patriotism: There are two types of love which a parent can show for their child. In the first type of love, your child commits murder and you take them to the police and hold them accountable for what they’ve done. In the second type of love, your child commits murder and you help them dispose of the body.